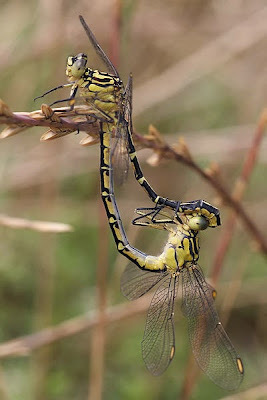 Mating pair of yellow-striped hunters Austrogomphus guerini, copyright Fir0002/Flagstaffotos. The Gomphoidea are a group of mostly small dragonflies, in which the larvae have a flattened prementum lacking a median cleft. The Late Jurassic and Early Cretaceous Proterogomphidae probably represent early members of this clade. The majority of living species are included in the family Gomphidae except the larger palaeotropical genus Ictinogomphus in the Lindeniidae, distinguished by the presence of crossveins in the triangle of the fore- and hind wings (Theischinger & Hawking 2006).